Early reactions came from Evangelicals, who were predominantly critical. Richard J. Mouw, president of Fuller Theological Seminary in Pasadena, Calif., remonstrated that he and other Evangelicals believe that “we have an obligation to present the claims of Christ to non-Christians.” Our Jewish friends, he added, “cannot demand that we think and act like liberal Protestants or Roman Catholics.” The president of Southern Baptist Theological Seminary in Lexington, Ky., A. Albert Mohler Jr., speaking on the Phil Donohue show, was even blunter in his insistence on the need for Jews to be converted. Jim Sibley, coordinator of Jewish ministries for the Southern Baptist Convention, complained that the Catholic-Jewish statement targeted Jews for exclusion from hearing the Gospel proclamation. Criticism of the dialogue statement came also from the Catholic side. Deal Hudson, editor of Crisis, declared that “the bishops’ committee has released a confusing, heavily nuanced, document at a time when trust in them is at an all-time low.... The letter carries absolutely no weight.... These are only the ruminations of a subcommittee of a committee of a small portion of the world’s bishops....” Scott Hahn, a theology professor at the Franciscan University of Steubenville, Ohio, pointed out that the statement went beyond recent Vatican affirmations on Judaism by seeming to teach that Jews can be saved without faith in Jesus and conversion. The Rev. John Echert, a professor at St. Thomas University in St. Paul, Minn., stated on the Web site of EWTN that the document “is an embarrassment, lacks any teaching authority” and may be a sign that the final apostasy is at hand. To some extent the negative reactions were based on inaccurate information. Contrary to the initial report issued by the U.S.C.C.B. Communications Office, the statement did not come from the conference or any of its committees. It arose out of a consultation between scholars named by the Bishops’ Committee for Ecumenical and Interreligious Affairs and the National Council of Synagogues. Cardinal William H. Keeler of Baltimore, the Catholic co-chairman of the dialogue group, explained on Aug. 16 that the document was unofficial and was published with the purpose of encouraging serious reflection on the issues in both the Catholic and Jewish communities. Covenant and Mission consists of two parts, embodying reflections by each group on the theme. The two parts are ill-matched, since the Catholic section is totally focused on Judaism, whereas the Jewish section says nothing about Christianity. The Catholic reflections—which are the subject of this article—are evidently intended to assuage the feelings of Jews who remember all too vividly the polemics and persecutions of past centuries. They rely heavily on a speech of Cardinal Walter Kasper, president of the Pontifical Council for Promoting Christian Unity, delivered to a Jewish-Catholic liaison group in New York on May 1, 2001 (Am., 9/17/01), in which the cardinal was attempting to defuse the anger over several recent incidents. The present dialogue statement therefore sets forth Catholic doctrine in a very irenic fashion. In tailoring their remarks to a particular public, the authors unfortunately gave grounds for the misinterpretations in the press accounts I have cited. The statement is ambiguous, if not erroneous, in its treatment of topics such as evangelization, mission, covenant and dialogue. This view of evangelization is difficult to reconcile with the teaching of recent popes. Paul VI declared in his 1975 apostolic exhortation Evangelii Nuntiandi that “there is no true evangelization if the name, the teaching, the life, the promises, the Kingdom, and the mystery of Jesus of Nazareth, the Son of God, are not proclaimed” (No. 22). He added: “Evangelization will also always contain—as the foundation, center, and at the same time summit of its dynamism—a clear proclamation that, in Jesus Christ, salvation is offered to all men, as a gift of God’s grace and mercy” (No. 27). John Paul II quotes these words approvingly in his 1990 encyclical Redemptoris Missio (No. 44). 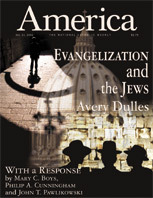 In Ecclesia in America, an apostolic exhortation published in 1999 after the Special Assembly for America of the Synod of Bishops, the pope, referring again to Paul VI, writes: “The vital core of the new evangelization must be a clear and unequivocal proclamation of the person of Jesus Christ” (No. 66). Covenant and Mission presents a concept of evangelization in which this vital core is dispensable. Unlike the popes, it seems to say that Christians can evangelize without pronouncing the name of Jesus. A second question concerns mission. Does the church have a mission to the Jews? The Catholic reflections proffer a negative answer. They quote Cardinal Kasper as saying, “The term mission, in its proper sense, refers to conversion from false gods and idols to the true and one God” and therefore does not extend to Jews, who already believe in the one true God. “Mission” and cognate terms in the New Testament and in traditional Catholic usage extend both to the Jews and to the Gentiles, not just the latter, although differences are of course recognized between the two groups (Acts 3:26; Gal. 2:8 and elsewhere). Even if, with Cardinal Kasper, one were to limit “mission” to the apostolate to the Gentiles, the church would not be absolved of her God-given responsibility to proclaim Christ to all the world. Peter on Pentecost Sunday declared that the whole house of Israel should know for certain that Jesus is Lord and Messiah and that every one of his hearers should be baptized in Jesus’ name (Acts 2:38). Paul spent much of his ministry proclaiming the Gospel to Jews throughout the diaspora. Distressed by their incredulity, he was prepared to wish himself accursed for the sake of their conversion (Rom. 9:3). Peter, Paul and the other New Testament authors would be astonished to find that the present document, after posing the question whether Christians should invite Jews to baptism, leaves it open and unanswered. John Paul II is not so hesitant. He declares that “missionary evangelization is the primary service that the Church can render to every individual and all humanity in the modern world” (R.M., No. 2). The call to conversion, says the pope, must not be dismissed as “proselytization” in the pejorative sense of that word, since it corresponds to the right of every person to hear the good news of the God who gives himself in Christ. Conversion to Christ, he notes, is intrinsically joined to baptism as the sacrament of regeneration (No. 47). While he does not “target” Jews in any special way for conversion, he makes no exception for them. He simply assumes, as all Christians must, that if Christ is the redeemer of the world, every tongue should confess him. If Jesus offers a share in his divine life through the sacraments, all men and women, not excluding Jews, should be invited to the banquet. The treatment of covenant, to my mind, is likewise questionable. “According to Roman Catholic teaching,” says the document, “both the Church and the Jewish people dwell in covenant with God.” While she lives by her faith in Christ, the Catholic Church “acknowledges that Jews already dwell in a saving covenant with God.” This statement, which seems to imply that Jews are not obliged to take cognizance of the new covenant, must be tested against the New Testament. The most formal statement on the status of the Sinai covenant under Christianity appears in the Letter to the Hebrews, which points out that in view of the new covenant promised by God through the prophet Jeremiah, the first covenant is “obsolete” and “ready to vanish away” (Heb. 8:13). The priesthood and the law have changed (Heb. 7:12). Christ, we are told, “abolishes the first [covenant] in order to establish the second” (Heb. 10:9). These passages from Hebrews do not overturn Paul’s insistence in Romans that the promises of God to Israel remain valid. The Hebrew Scriptures, containing God’s promises, have enduring value, but are to be interpreted in the light of Christ to whom they point forward. The elect have obtained what was promised, though the rest were hardened (Rom. 11:7). “And even the others, if they do not persist in their unbelief, will be grafted in” (11:23). Paul in fact looks forward to a day when all Israel will recognize Christ and be saved (11:26). He does not mean that Israel is already saved by adherence to the Sinai covenant. In view of his promises to them, God has a special providence over Israel. The Jews have a status distinct from the Gentiles. It would be a mistake to read the passages from Hebrews and Romans as if they contradicted one another. No New Testament author could be interpreted as holding that there are two independent covenants, one for Jews and another for Christians, running on parallel tracks to the end of history. A final equivocation has to do with dialogue. The document quotes Cardinal Kasper to the effect that dialogue is “far away from any kind of proselytism,” and is a process of mutual learning and enrichment. Eugene J. Fisher, associate director of the Secretariat for Ecumenical and Inter-religious Affairs of the U.S.C.C.B., one of the participants, had declared in the John Courtney Murray lecture in 1999: “Dispute is not dialogue. Dialogue seems to know what is hurtful to the other and to avoid it” (Am., 9/11/99). It is of course desirable to ease tensions, but the avoidance of controversial points can easily lead to ambiguity and dissimulation. Covenant and Mission seems to imply that conversion to Christ, baptism and adherence to the church are no longer considered important for Jews. Here again, Pope John Paul II provides a valuable corrective. Although he is always courteous and respectful to dialogue partners, he insists that those engaged in interreligious dialogue “must be consistent with their own religious convictions and traditions.... There must be no abandonment of principles nor false irenicism, but instead a witness given and received for mutual advancement on the road of religious inquiry and experience (R.M., No. 56). On the part of Catholic Christians, “dialogue should be conducted and implemented with the conviction that the Church is the ordinary means of salvation and that she alone possesses the fullness of the means of salvation” (No. 55). This does not mean, of course, that we must despair of the salvation of non-Christians or that they are to be pressured into accepting our faith. On the contrary, Vatican II made it clear that God offers the possibility of salvation to all who conscientiously strive with his help to find his truth and do his will, and that explicit Christian faith, while it is a great blessing, must always be free and uncoerced. It has been well said that those who withdraw from evangelization weaken their own faith. Once we grant that there are some persons for whom it is not important to acknowledge Christ, to be baptized and to receive the sacraments, we raise questions about our own religious life. If we are convinced that baptism incorporates us into the body of Christ and that the Eucharist nourishes us with his flesh and blood, we will be eager to share these gifts as widely as possible. Our Jewish brothers and sisters could question our sincerity if we were to tell them that the blessings of the New Covenant need not concern them. The document Covenant and Mission does not forthrightly present what I take to be the Christian position on the meaning of Christ for Judaism. Hooray for Cardinal Dulles. In his book, The Craft of Theology, Cardinal Dulles said "By seeking to accommodate all points of view, we cheapen the value of communion itself... If faith is, as we believe, a matter of fidelity to a sacred trust, unity must not be purchased at the expense of honest conviction." Nothing can be more poignant. To me "Reflections on Covenant and Mission" is more like a lawyers' document filled with skewed words and stretched definitions. And they threw out the baby with the bubble and the baby was Jesus. Maintaining doctrinal integrity must be the basic tenet of the both parties in interreligious dialogue. “Practicing the Faith,” by John F. Kavanaugh, S.J. (11/4) gave me some comfort, the kind that comes from finding that one is not alone. Almost like Father Kavanaugh’s student-friend, I am connected with Catholic history and tradition and sought a truth worth understanding, a good worth loving and a faith to die for. Unlike the student, I believe that I have found it. (I am also some 50 years older than she is.) I have opposed capital punishment all my adult life, regard abortion as a moral and social evil, abhor the School of the Americas, the evil (yes, Mr. Bush, evil) practices that it teaches so well and the hypocrisy that allows our government to sponsor it. I also regard Bush’s obsession with war on Iraq as his own personal grudge match, no casus belli in any language. I regard many of my country’s foreign policies as bullying and its domestic policies as shortsighted and oblivious to the needs of the poor. Along with the late Malcolm Muggeridge, I would like to see Christ walking barefoot through the Vatican. Christ was a radical, and oddly, the older I get the more radical I seem to become. At least I’m not alone! Of course God’s covenants (plural, please) with Abraham, Isaac, Jacob, Moses, David et al., have never been revoked. But when did Catholic tradition begin to “set aside” inconvenient biblical truths, rather than learn to live with the tension between seemingly incompatible precepts? We used to call these mysteries. Cardinal Dulles, always polite, terms the views expressed in Covenant and Mission “ambiguous, if not erroneous.” To this observer, they appear deficient, defective and distorted. I think it is clear who is making a dreadful mistake. Perhaps evangelization (as opposed to proselytization) might be best understood as proclaiming the Gospel, forthrightly and honestly, to everyone who is willing to listen. Avery Dulles, S.J., as the only American theologian ever to be raised to the College of Cardinals, is arguably, at least in the eyes of the Vatican, the most respected theologian in the country. Yet when he submits an article to your magazine on the important question of evangelization (10/21), you not only submit it to others for a comment to be published in the same issue, but print a response that is longer than his original article. It would seem to me America’s editors should swallow their bias and treat a brother Jesuit with greater respect. I read with interest Cardinal Avery Dulles’s article “Evangelization and Mission (10/21) and the committee’s response to it. Charity is the foundation of human existence. The expression of this love is in the fullness of God’s gift to all, his word and his communion with us through Scripture and the Eucharist. Through Christ, this bit of “heaven on earth” is the foretaste of beatitude. Men and women have a choice to believe or reject this. Belief or rejection follows evangelization. How is it possible for anyone to choose to believe or to reject, if I am to withhold my tongue? This fullness of communion brings joy and life to the fiber of my being. I desire to share this with all my brothers and sisters. Why would I withhold this from anyone, especially a Jew with whom I share a common understanding of the created world? Catholic is not what I am but who I am. Does the committee reject the truth that Catholicism embodies the fullness of communion between God and humankind or that the New Testament is the fulfillment of the Old Testament? If so, say so, and do not pretend to represent a Catholic position. Charity, love of God and my brothers and sisters, demands that I give what I have, my most precious gift, my faith (myself), to all who pass my way. All men and women are invited without exclusion. If I am to be silent and accept the muzzle and the falsehood of religious indifferentism, then I have no charity. I must confess that reading “Covenant and Mission” (10/21) last night made my head hurt—as do other America articles from time to time. I was no doubt more sensitive than I would normally be to Cardinal Dulles’s position. I am in Minneapolis to work on the Paul Wellstone campaign, unable to come to grips with his death two days ago. As a Capitol Hill union lobbyist, it is my opinion that Senator Wellstone, a Jew, more than any other U.S. senator lived what we would call “Gospel values.” I wonder who should be evangelizing whom? Christ Has Revealed to His Church, through His Life, His Passion, and His Death on The Cross, that Perfect Love requires desiring Salvation for one's beloved. There Is only ONE True God, The Perfect Communion of Love that Is The Blessed Trinity, Who Was in The Beginning, Is Now, and Forever Will Be. Those who profess to be Jewish or Muslim, or do not believe in The Blessed Trinity, are not worshipping the same God as those who worship The Blessed Trinity as Christ Has Revealed to His Church, in the trinitarian relationship of Sacred Tradition, Sacred Scripture, and The teaching of His Magisterium. Our Mission is to always be ready to give an explanation for The Hope that is in us, to give witness in order to lead others to Christ, for Love requires desiring Salvation for one's beloved. This article also appeared in print, under the headline "Covenant and Mission," in the October 21, 2002 issue. Cardinal Avery Dulles, S.J., is the Laurence J. McGinley Professor of Religion and Society at Fordham University, New York City.